The decade-long (1576-1586) reign of Polish King Stephen Bathory (Stefan Batory) ushered in of the “golden age” of the Polish-Lithuanian Commonwealth (Rzeczpospolita). The son of Transylvanian Prince Stephen IV, an ethnic Hungarian, he occupies a place next to King Jan III Sobieski, who defeated the Turks in the famous Battle of Vienna in 1683, in the historical pantheon of our Polish neighbors. Before the Polish Kingdom and the Grand Duchy of Lithuania signed the Union of Lublin in 1569, the Ukrainian lands except for Halychyna and the western outskirts of Volhynia and Podillia had been under Lithuania. In Lublin, the Polish nobility tried to make the most of even the dynastic crisis: as Sigismund (Zygmunt) II Augustus, the last Polish king of the Lithuanian Jagiellonian dynasty, had no heirs, his daughter Anna Jagiellonka remained the last link between the Poles and the Lithuanians. The death of Sigismund II Augustus in June 1572 signaled the advent of an interregnum. Then, in early 1574, French Prince Henri of Valois was elected king, but this option proved to be a complete failure. At the death of his brother, King Charles IX of France, he literally fled Krakow and returned to Paris incognito. Almost a year later, the Sejm assembled to elect a new sovereign. Among the contenders for the crown were Holy Roman Emperor Maximillian; his brother Ferdinand and son, Archduke Ernest; Swedish King Johan; Duke Alfonso of Ferrara; Tsar Ivan the Terrible of Muscovy; and Stephen Bathory, a protege of the Turkish sultan. The magnates and nobles failed to pass a majority vote and elected two monarchs — Maximillian and Anna Jagiellonka on condition she married Stephan Bathory. The crisis was finally overcome in April 1576, when the Transylvanian prince arrived, contrary to the emperor’s wishes, in Krakow with a large retinue and married the 50-year-old Anna. From the very first minutes of being on the throne, the 42-year-old Stephen Bathory found himself in the hot seat: the gentry, spoilt by what was termed democratic licentiousness, preferred to view him as merely an obedient plaything, while the wealthy magnates did not want to give up power either. The king relied on the middle gentry consisting of European-educated administrators. Among them was Chancellor and later Crown Hetman Jan Zamojski. The Transylvanian finally managed to curb the discontented nobility (“I don’t want to be a king on paper only, I won’t listen to anybody telling me what to do”): he ordered Grzegorz Oscik and the omnipotent magnate Samuel Zborowski to be executed, the former for secret talks with Ivan the Terrible. The Sejm also had to validate the king’s edict on banishing Andrzej and Krzysztof Zborowski from the commonwealth for life. After solving his domestic problems, the king began to prepare for a war against Muscovy, which had seized Livonia by defeating the Livonian Knights and Lithuania. Stephen Bathory’s plans attached by no means the least importance to Zaporozhzhian Cossacks who formed a buffer zone on the Commonwealth’s southeastern borders. Like his predecessors, the king considered it necessary to keep them in his military service. Before him, Sigismund II Augustus had had 300 Cossacks take an oath of allegiance. But it was Bathory who in fact established a registered Cossack force by issuing the edict called The Agreement with Lowlanders in September 1578. The king increased the number of the registered Cossacks to 500 and, in 1583, to 600. Under the royal agreement, the Cossacks were exempt from taxation and enjoyed complete independence from the local administration. A senior officers’ corps was formed, as was the general staff headed by a pysar (clerk) who could, if necessary, stand in for the “most senior registered officer” (later, the hetman). In addition, the Cossacks were granted a privilege to own the town Trakhtemyrov, the seat of Kyiv wojewodstwo’s administration, on the Dnipro upstream of Kaniv. There was the famous Zarubynsky Monastery in Trakhtemyrov, at which the Cossacks opened a hospital. The Cossacks also had their own arsenal. Equally important was the privilege to possess official insignia (kleinody), such as the gonfalon, standard, and seal, which legitimized the “lowlanders’” new status. Interestingly, monarchs who wished to have the Cossacks as allies would often send them insignia. For example, “Emperor Rudolph II, who wanted to draw the Cossacks into a war against Turkey, decided to present them with a royal gonfalon and 8000 ducats” (S. F. Plecki). During the reign of Stephen Bathory, the registered Cossacks and many Zaporozhzhian volunteers most actively participated in the final stage of the Livonian War, particularly, in the Siversk region. The Polish-Lithuanian troops laid siege to and took Polock and Velikiye Luki by storm. They kept Pskov under siege for several months and signed the Treaty of Zapolsk in 1582, under which Polock and Livonia remained part of the Commonwealth. The king had a host of problems with unregistered Cossacks who numbered several tens of thousands. 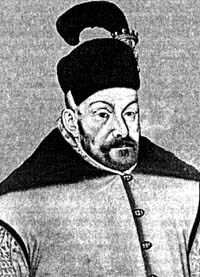 For instance, Ivan Pidkova, a swashbuckling Cossack warlord and contender for the Moldovan throne in 1577, clearly did not fit in with Bathory’s foreign policy plans and had to pay with his head for this. He was executed in the spring of 1578 in Lviv. (A monument now stands at this place to the leader of “lowlanders.”) The king, who waged a fierce war against Muscovy on the northern frontiers of Poland- Lithuania, did not want to endanger Podillia, Halychyna, Volhynia, or, the more so, his native Transylvania, a vassal to the Ottoman Empire. After Stephen Bathory, who managed to defeat Muscovy, died in 1586, the registered Cossacks continued to serve the new kings, hoping for new privileges from them and, simultaneously, laying down their lives in their service to the monarch. At the beginning of the seventeenth century peasant and Cossack rebellions were quelled equally; they often participated in Polish punitive expeditions, but they equally often took the rebels’ side (first of all, due to ethnic-religious oppression and the royal government’s failure to honor its commitments). Stephen Bathory was the first to outline the rights and duties of the registered Cossacks who served the Polish Crown. The registered Cossacks brought forth such prominent statesmen, hetmans and warriors as Bohdan Khmelnytsky, Petro Konashevych-Sahaidachny, and Petro Doroshenko. A streamlined organization of the registered Cossacks, making special rosters, helped the government in Krakow and later in Warsaw to keep a regular combat-ready army inexpensively. The Cossacks took part in many wars that Poland-Lithuania waged against Muscovy, Sweden, Turkey, and the Crimean Khanate. The officially recorded number of Poland-ruled registered Cossacks at the turn of the seventeenth century ranged between 600 and 40,000 (according to the 1649 Treaty of Zboriv). Although the Cossacks saved Poland-Lithuania from defeat several times, the kings and magnates always infringed on Cossack rights. For example, the government drafted about 40,000 Cossacks for the Khotyn war of 1621, but, after the Ukrainian-Polish army won a brilliant victory over the Turkish-Tatar troops, the Sejm thanked the former by drawing up a roster of 6,000 Cossacks. During the Cossack Revolution led by Bohdan Khmelnytsky, registered Cossacks were the main striking force in the battles of Zhovti Vody, Korsun, Piliavtsi, and Batih. “Over the eighty years from the Lublin Union until the general crisis of 1648, the Polish-Lithuanian Commonwealth felt better than its neighbors. Baltic trade brought unheard-of riches to more than one aristocrat..., the victorious Transylvanian Stephen Bathory... restored respect for the royal power and forced the complex state machine to work effectively,” English historian Norman Davies writes in his Europe: A History.